Truman Streckfus Persons was a novelist, screenwriter, playwright and actor, born on 30th September 1924 in New Orleans, Louisiana USA, with many of his novels, short stories and plays written under his stepfather’s surname – hence Truman Capote – being recognized as literary classics, including the 1958 novella “Breakfast at Tiffany’s” and the true crime novel “In Cold Blood” (1966). His work led to at least 20 film and television adaptations. He passed away in 1984. 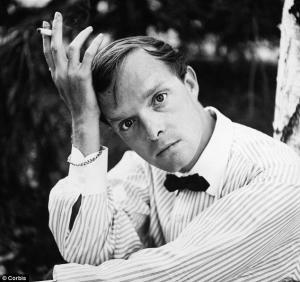 Have you ever wondered how rich Truman Capote was? According to sources it has been estimated that Truman Capote’s overall net worth was $10 million, accumulated through an extraordinarily successful writing career, during which he published more than 30 editions and became one of the 20th century’s best known writers. His career spanned four decades, during which his popularity and net worth increased significantly. Truman Capote was born into a family of odd parents, who largely neglected their son, often leaving his upbringing to other people, meaning that Capote spent most of his childhood with his mother’s relatives in Monroeville, Alabama. This is where he made friends with young Harper Lee, who would also later become a famous writer. After his parents’ divorce, Truman moved with his mother and stepfather Joe Capote to New York, and in 1935 his name was changed to Truman Garcia Capote. During schooling, he was a mediocre student as he did well in courses that he was interested in, but paid barely any attention to those he didn’t like. He went to a private boy’s school in Manhattan from 1933 to 1936, where he showed his talent for story-telling and writing. Capote’s family then moved to Greenwich, Connecticut, where Truman started attending Greenwich High School. As his family life became worse due to his mother’s alcoholism, Capote didn’t do well in school, and after the family returned to Manhattan, he had to repeat 12th grade at the Franklin School. He was still in his teenage years when he got his first job as a copyboy for “The New Yorker” magazine, in which he tried to get his stories published but with no success. Truman eventually left this job to fully dedicate his time to writing. His first successes were short stories, such as “Miriam” which was published in Mademoiselle in 1945, and in 1946 winning the prestigious O. Henry Award. Soon, a few of his other stories were published, such as “A Tree of Light”, “My Side of the Matter” and “Jug of Silver”, which launched his literary career and established his net worth. Two years later, his first novel, “Other Voices, Other Rooms” was published to mixed reviews, but eventually sold well. His collection of short stories, “A Tree of Light”, repeated the success of his novel, and he soon published a book containing his travel essays, entitled “Local Color”. Not long after, in the fall of 1951, his second novel, “The Grass Harp” was also published, and was soon adapted for stage. In the early ‘50s, Truman started writing film scenarios for films such as “Stazione Termini”, “Beat the Devil” and Henry James novel adaptations “The Turn of the Screw” and “The Innocents”. It was in 1958 that he scored perhaps his greatest success, with “Breakfast at Tiffany’s”, the film version of which was released three years later, starring Audrey Hepburn. In 1965, after years of working on it, Capote published his non-fiction novel “In Cold Blood”, which was based on a true story that he and Harper Lee had witnessed. The novel became an instant best-seller, and truly brought Truman acknowledgement and increased wealth. However, he soon took to drinking and taking tranquilizers, which escalated over the years. His last major work, a collection of non-fiction and fictional pieces, “Music for Chameleons”, was published in 1980. Privately, Truman’s life-long friend was writer Harper Lee, and the character of Idabel from novel “Other Voices, Other Rooms” was based on her. His partner for a number of years was Jack Dunphy. After suffering from two bad falls, Capote died on 25th August 1984 in Bel Air, Los Angeles, California, apparemtly also from complications of liver disease. 1 I don't care what anybody says about me, as long as it isn't true. 2 Do you want to know the real reason why I push my hair down on my forehead? Because I have two cowlicks. If I didn't do that it would make me look as though I had two feathery horns. 3 [on Humphrey Bogart] He had an image of sophisticated virility and he projected it remarkably well. And with such humor. At last, he had such style that it doesn't wither, it doesn't age, it doesn't date. Like Billie Holiday. 4 [on Marlon Brando] No actor of my generation has possessed greater natural gifts; but none other has transported intellectual falsity to higher levels of hilarious pretension. 5 New York is a diamond iceberg floating in river water. 6 [on Marilyn Monroe] She is pure Alice in Wonderland, and her appearance and demeanor are a nicely judged mix of the Red Queen and a flamingo. 7 [on Meryl Streep] She looks like a chicken! 8 The greatest thing about masturbation is that you don't have to dress up for it. 9 I think I've written one masterpiece in my career and that's "In Cold Blood". It is a masterpiece and I don't care what anyone says. I think I've also written three or four short stories that are as good as anything written in the English language. 10 It's a scientific fact ... For every year a person lives in Hollywood, they lose two points of their IQ. 1 Despite his diminutive size, he was said to have been an excellent arm wrestler. 2 "Capote" was actually his stepfather's last name. 3 His life was touched by tragedy. His mother committed suicide and, according to the coroner's report, Capote himself died from "liver disease complicated by phlebitis and multiple drug intoxication". 4 He is mentioned in Walter Kirn's novel "Thumbsucker" and the Allan Sherman song "Oh Boy". 5 Biography in: "The Scribner Encyclopedia of American Lives". Volume One, 1981-1985, pages 128-130. New York: Charles Scribner's Sons, 1998. 6 According to George Plimpton's biography "Truman Capote: In Which Various Friends, Enemies, Acquaintences and Detractors Recall His Turbulent Career," one of Capote's eccentricities was to walk into a liquor store and ask for a bottle of "Justerini and Brooks" scotch, which is more familiarly known as J&B, which is one of the most famous brand names in the liquor business. Even if a merchant told him the store did not carry the brand (as most people didn't know what the initials stood for), even when it was likely it did carry the brand, Capote would not call it "J&B", even if it meant that he went without it. 7 Portrayed by Sam Street in Isn't She Great (2000), Philip Seymour Hoffman in Capote (2005), by Toby Jones in Infamous (2006), by Michael J. Burg in The Audrey Hepburn Story (2000) and by Robert Morse in the award-winning one-man show "Tru" (and the subsequent made-for-TV film, American Playhouse: Tru (1992)). 8 Was called as a defense witness in the second trial of Claus von Bülow, testifying about Sunny's [Martha Sunny von Bulow] history of substance abuse. 9 His aunt, who helped raise him as a boy, is Marie Rudisill, aka The Fruitcake Lady from the The Tonight Show with Jay Leno (1992). 10 Rests in a mausoleum next to Heather O'Rourke and Mel Tormé. 11 The film rights to his novella, "Hand Carved Coffins" were held by producer Dino De Laurentiis and the project was offered to directors Michael Cimino and David Lynch but to date, the project has not been produced. 12 Although he wrote only a handful of books during his lifetime, he produced 25 full-length plays, two novels, 60 short stories, more than 100 poems and an autobiography. 13 Was a distant relative (seventh cousin once removed) of playwright Tennessee Williams. 14 Longtime partner was Jack Dunphy. 15 He is one of several famous and tragic figures from history to be featured on the sleeve artwork of the album "Clutching at Straws" by rock band Marillion (released in 1987). 16 His most famous work is the book, "In Cold Blood." 17 Is the inspiration for the character "Dill" in Harper Lee's novel "To Kill a Mockingbird". He and Lee were childhood friends. 18 Frequently visited legendary New York disco Studio 54 in the late '70s. One Christmas 1994 TV Movie short story "One Christmas"
Trilogy 1969 screenplay / stories "A Christmas Memory", "Miriam" and "Among the Paths to Eden"
Ruohojen harppu 1965 TV Movie play "The Grass Harp"
Barbra Streisand and Other Musical Instruments 1973 TV Special writer: "I Never Has Seen Snow"
Peterson Plays Farnon... ...Plays Peterson 1969 TV Movie writer: "A Sleepin' Bee"